Whether you realize it or not, you have lived many lives, and each one has left an indelible mark on your soul. TO BURROW, TO HEDGE, TO NEST. FOR CUDDLES, STORIES AND REST. “THE BEST PART OF THE DAY!" 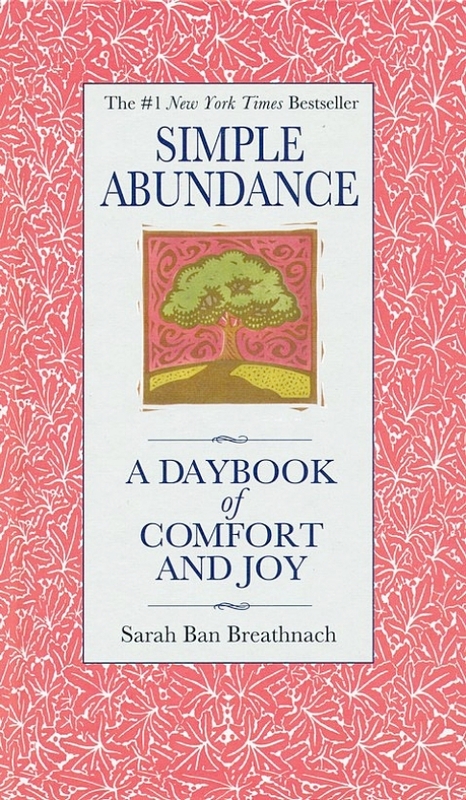 In her international bestseller Simple Abundance, Sarah Ban Breathnach inspired millions of women to find happiness in each day of their lives. 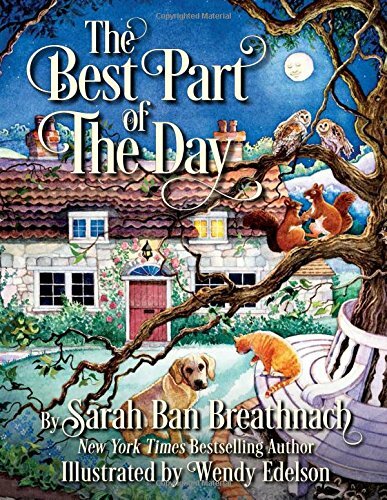 Now Ban Breathnach is back with her first children's book, The Best Part of the Day. Beautifully illustrated by Wendy Edelson and lyrically written by Sarah, this "good night" story encourages children to find at least one moment in each day that is worthy of celebration. The Best Part of the Day is the perfect addition to any family's nighttime routine. When I looked at my life’s ledger I realized I was a very rich woman. What I was experiencing was merely a temporary cash-flow problem. Finally, I came to an inner awareness that my personal net worth couldn’t possibly be determined by the size of my checking account balance. Neither can yours. When money is plentiful, this is a man's world. When money is scarce, it is a woman's world. 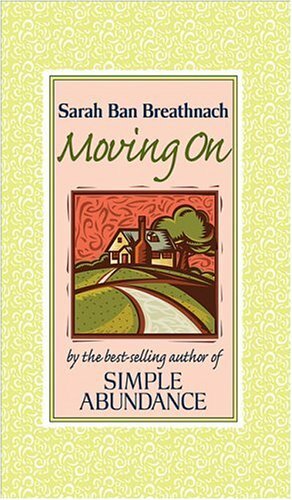 With the grace of her groundbreaking bestseller Simple Abundance, Sarah Ban Breathnach returns, offering enragement and hope for women who have lost their financial and spiritual way in the world. 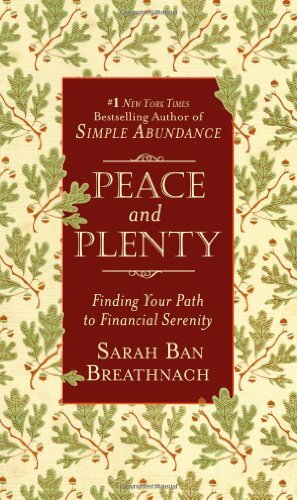 Peace and Plenty is Sarah's answer to the world's--and her own personal--fiscal crisis. Writing in the style so beloved by her millions of readers around the world, she weaves together in this deeply personal money memoir, a compendium of advice, stories from her life, and excepts from the magazines, books and newspapers--particularly from the Great Depression--to inspire and motivate readers who are mired in economic problems today. 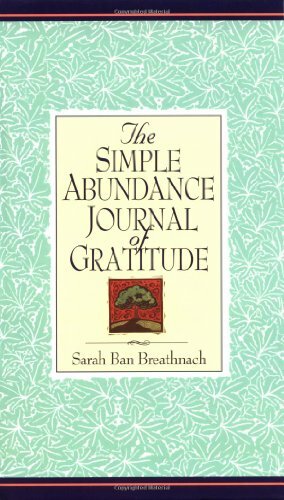 For years, Sarah Ban Breathnach has been a reassuring guide, illuminating the beauty and meaning in the everyday. Readers who are financially strapped will immediately feel how deeply she understands their situation as she provides support and cheer on the path to financial serenity. YOU ALREADY POSSESS ALL YOU NEED TO BE GENUINELY HAPPY. ALL YOU TRULY NEED IS THE AWARENESS OF ALL YOU HAVE. TODAY. This beautiful journal, which Oprah Winfrey referred to as "life-changing" is a lovely companion to the national bestseller Simple Abundance. Providing women with a place to record their daily moments of gratitude while also offering insight via inspirational quotes. You may have a beautiful home, a family you adore, and work that you enjoy. But why do you secretly sense that you need something more to be truly happy? Because it's true. 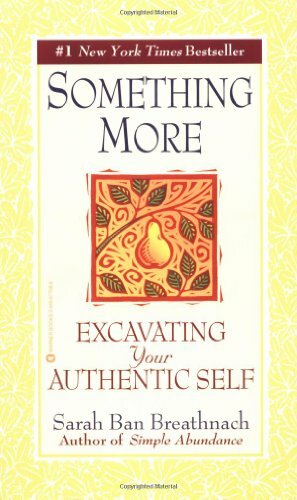 In this eloquent and evocative book, Sarah Ban Breathnach encourages you to become an archaeologist of your Self; to delve into your past and "excavate" the authentic woman buried inside by other people's expectations of who you should be, not the truth of marvelous woman you really are. Uncovering your true Self will be challenging but exhilarating. Assisting your personal "dig" will be insights from the lives of both celebrated and unknown women and from Sarah herself. As you unravel your own mystery and recover the joy that has been missing from your life, you will experience small but exquisite epiphanies that will help you make peace with your past and reveal exciting new opportunities for your future. Dare to plumb the depths. Powerful truths are waiting that can change your life...and inspire you to settle for nothing less than SOMETHING MORE. The real power of this work ...lies in [its] unpretentious sincerity and raw immediacy...Writing not as a guru but as a friend who has learned to cherish her past, Ban Breathnach will galvanize her wide readership to believe we were all were put on earth for something more than indifferent marriages and discarded dreams. Serving up self-worth and "repose of the soul" as the most priceless of attainments, she is a friend indeed. "If a woman has wealth, love and health, she is considered fortunate. Yet millions of women find themselves searching for more out of life. Sarah Ban Breathnach invites her female listeners to dig deeply within themselves and seek abandoned desires and lost dreams. Ban Breathnach is an inviting reader who draws in her listeners with warmth and sincerity... [and her] convincing revelations will inspire and encourage women to plunge into a deep pool of soul-searching. Promises predict a woman's future better than any crystal ball ever could. That's because the promises we make decide how we shall spend, invest, or squander our Life's currency: time, creative energy, and emotion. 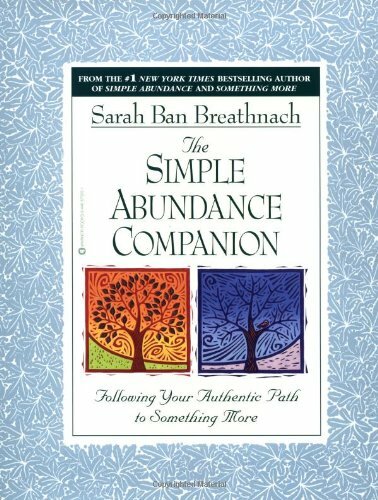 Before Simple Abundance was a bestselling book, it was a highly successful workshop taught by author Sarah Ban Breathnach. Returning to the workshop format, Sarah has created this workbook-style companion guide. Devised as a month-by-month course, this 12-chapter book is a whole year of soul-craft. Consider this workbook a personal tutorial. Just Sarah and you. Maybe add a few of your closest pals. But please, let's think girls-night-out instead of study group! From gratitude to play, from connecting to the sacred to facing your fears, Sarah provides thoughtful exercises with reflective lessons on topics such as "Choice As a Spiritual Gift," "Becoming Real" and "Sacred Connections." At the end of each chapter Sarah lists "Soul Assignments," which include penetrating questions alongside lighthearted assignments: going on "creative excursions" or learning to "color outside the lines" of life. I THINK A MAN'S JOURNEY TO SIMPLE ABUNDANCE DEEPENS AND BROADENS THE ETERNAL ROMANCE BETWEEN ADAM AND EVE. CERTAINLY, IT WAS WRITTEN IN THE SPIRIT OF BRINGING MEN AND WOMEN CLOSER TOGETHER BY REVEALING OUR SIMILARITIES, NOT JUST OUR DIFFERENCE. PART OWNERS'S MANUAL, PART GUIDEBOOK, A MAN'S JOURNEY EXAMINES THE PRIVATE PILGRIMAGES THAT OCCUR IN EVERY MAN'S LIFE AND THE COMPASS THAT STEERS HIM TOWARDS LIFE'S TRUE NORTH. 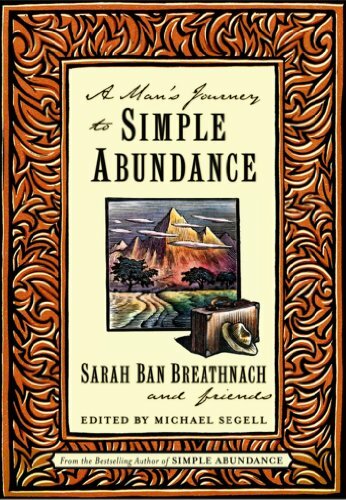 After empowering millions of women through her ground-breaking Simple Abundance and its companion volumes, Sarah Ban Breathnach was deluged by requests that she also write "a Rosetta stone for understanding men." Yet, Sarah also knew that she needed a man to help her represent an authentic male experience. So she invited Michael Segell, former "Men's Mind" columnist for Esquire and author of Standup Guy and The Devil's Horn to join her in creating A Man's Journey to Simple Abundance, a candid and courageous collection of 50 original essays written by men who come with a wide array of experience and perspective that Publisher's Weekly praised for succeeding "remarkably well in depicting men's feelings and complexity." The stellar contributors include Sting who speaks honestly about risk; Rick Bass on men's grief,;Christopher Dickey on coming to terms with his famous father, poet James Dickey; Jim Harrison, Larry Brown, Richard Bausch, Roy Blount, Jr., Benjamin Cheever as well as a champion surfer, an army general, a rabbi (bestselling author Shmuley Boteach) and a hermit who writes amusingly on solitude. This is a marvelous collection of 55 pithy essays by and about men...[is] Simply Terrific. Distinguished across the board by their honesty, a number of the pieces are moving… Others are funny…enlightening…and shocking. Think of the peace and plenty journal of well-spent moments as your private numbered account, a compilation of wisdom and wealth that the world cannot take away. 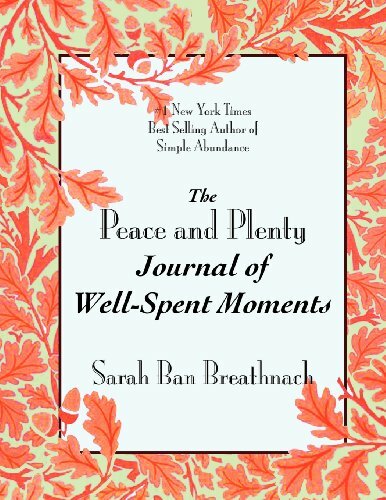 Welcome to your new insight tool, the Peace and Plenty Journal of Well-Spent Moments created by Sarah Ban Breathnach, the New York Times best-selling author of Simple Abundance, as a companion volume to her acclaimed money memoir Peace and Plenty: Finding Your Path to Financial Serenity. What is a "well-spent" moment? Well, the expression is a play on words--we really spend very little on the things that make us truly content. The things that matter most are priceless. Here in these pages, you will find comforting home-grown rituals and seasonal suggestions to help you bring more comfort and contentment into your daily round. To inspire you Sarah has shared a bounty of blessings that bring her deep satisfaction and an increased sense of well-being throughout the year. Let her gently encourage you to keep calm and carry on as you discover the well-spent moments waiting to be savored and cherished each day. WOMEN WERE CREATED TO EXPERIENCE, INTERPRET, REVEL IN, AND UNRAVEL THE MYSTERIES OF LIFE THROUGH THEIR SENSES. OUR SENSES SPEAK THE SECRET LANGUAGE OF THE SOUL—LONGING. IF THERE IS ANYTHING EVERY WOMAN UNDERSTANDS—WHETHER SHE IS SINGLE OR MARRIED, EIGHTEEN OR EIGHTY—IS THE DIALECT OF DESIRE. EMOTION IS THE FEMININE MOTHER TONGUE. 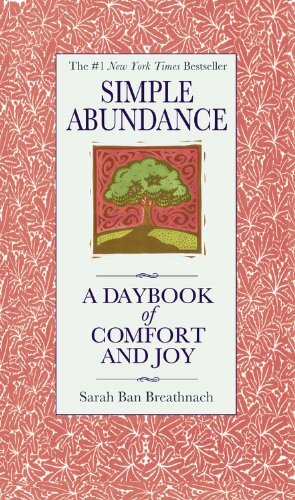 #1 "New York Times" bestselling author Sarah Ban Breathnach takes readers to a new level of personal fulfillment and spiritual awareness as they learn to rediscover and savor the sensual experience of daily life. Romancing the Ordinary celebrates the spirituality of the senses, seasonally and monthly. Sarah Ban Breathnach believes that women are endowed not with five senses but with seven. In addition to rediscovering sight, sound, scent, taste, and touch, readers will come to cherish their sense of "knowing"--a woman's intuitive sense--and "wonder," her sense of rapture and reverence. Drawing on myth, literature, film, music and drama, Sarah encourages each woman to discover what moves her to tears, makes her heart skip a beat, and her soul sigh. Interwoven with the reflections are seasonal indulgences intended to restore weary feminine souls--rituals, decorating, fashion and gardening hints. 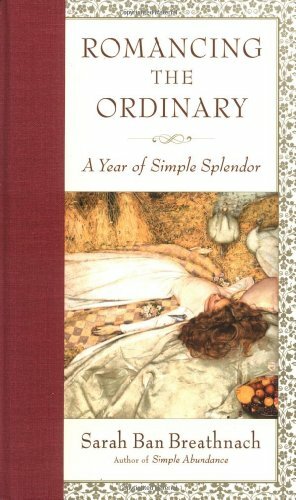 By encouraging her to delight in the often overlooked gifts of every day--from the aroma of simmering homemade spaghetti sauce to the sensation of freshly laundered linen against bare skin--Romancing the Ordinary is sure to help every woman fall in love with Life. of pampering, or who are looking for sheer escapism on a cold winter's day. IT DOESN'T MATTER WHOM YOU LIVE WITH OR WHERE YOU MOVE FROM OR TO, YOU ALWAYS TAKE YOURSELF WITH YOU. IF YOU DON'T KNOW WHO YOU ARE, OR IF YOU'VE FORGOTTEN OR MISPLACED HER, THEN YOU'LL ALWAYS FEEL AS IF YOU DON'T BELONG. ANYWHERE. "We do not know how to move on," Sarah Ban Breathnach observes. "We have learned to let go, but not move on." Did you know that the name of the greatest lover of all time, Casanova means "new house"? More often than we realize true love is concealed in wood and stone instead of flesh and bone. If you're interested in perusing these pages, you're a kindred spirit who suspects, or at least hopes, that our shared passion--the pursuit of domestic bliss--is a truth much deeper than discovering the perfect paint chip or fabric swatch. (Although finding both has been known to make me gasp with delight!) I believe with all my heart that the pursuit of domestic bliss is a spiritual path, a sacred endeavor, and more the spare bedroom covered to ceiling with clutter, than the road less traveled. However, I've got to be honest with you before we begin. The truth that a woman's home is the most accurate barometer of her emotional, physical, psychological, and spiritual well-being is as unsettling at times as it is reassuring. Nonetheless, the home is the surest diagnostic laboratory I've seen for discovering the deepest longings of the feminine soul and understanding how much time, creative energy emotion and nurturing She needs to be restored. Part meditation, how-to-manual and memoir, Moving On is for anyone who has ever wanted to revamp her life and the space where she lives it. More often than not, we discover who we are and what we love through revelations found in the small, the simple and the mundane. IN tiny choices. The unconsidered. The overlooked. The discarded. The reclaimed. In moments I call everyday epiphanies. The Illustrated Discovery Journal puts you on the path of pure intuition and feeling. Here you'll collect random pictures that appeal to you--images culled from periodicals or cut out of catalogs, photographs, or postcards. And here, with Sarah's encouragement, you'll reverently and reflectively assemble them into collages that reveal just about anything you might ever want to know about yourself. Your passions. Your preferences. What tickles you. What ticks you off. What makes you happy. 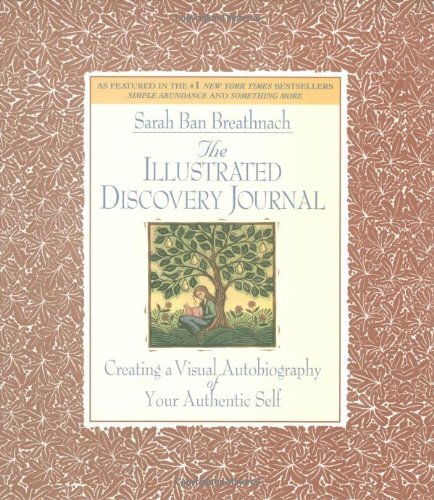 From discovering why a certain shade of blue makes you smile, to suddenly comprehending the source of a problem in a friendship, to recognizing your deep spiritual beliefs, the nine sections of The Illustrated Discovery Journal will lead you to the hidden side of your authentic self as no other book can. Antiquing is a passion of mine, a therapeutic, meditative, creative and spiritual practice. Somehow sifting through the domestic shards of those who no longer can bear witness to life's glorious mystery helps me ransom, reclaim and redeem what is truly precious in my own life. Forgive us for being so bold, but are you pleased with your family life? If your answer is "no" or even "I'm not sure", then may Mrs. Sharp be of assistance? Within the cozy confines of this charming volume, you will meet Mrs. Victorianna Sharp, a noted 19th century "literary domestic", and the delightful creation of Sarah Ban Breathnach's imagination. 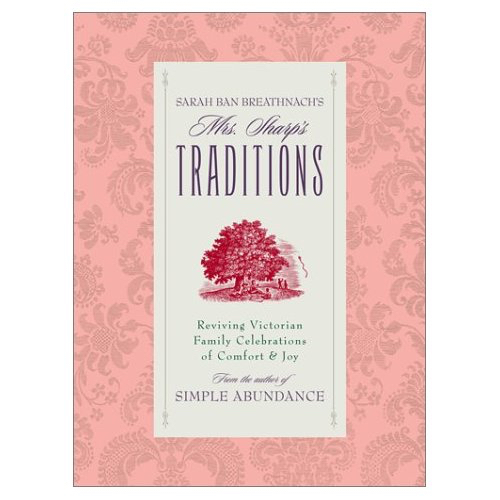 Originally published in 1990, Sarah's first book, Mrs. Sharp's Traditions, reveals how the seeds for her ground-breaking bestseller Simple Abundance were sown a century before during the Victorian era. In this lavishly illustrated, redesigned and sensitively revised edition, which includes a new introduction by Sarah, she shares how her passion for women's domestic advice columns was ignited by the discovery of an old trunk containing pristine women's and children's magazine from the Victorian era. Indeed, in this "Simple Abundance for families" Sarah introduces her legions of new readers to the old-fashioned pleasures of home centered customs, daily rituals and the rhythm of the seasons. 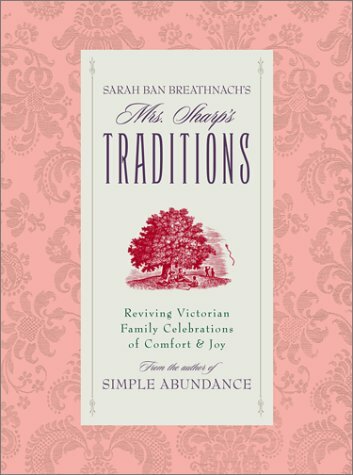 Full of heart and insight, Sarah Ban Breathach's Mrs. Sharp's Traditions celebrates century old secrets for bringing a family closer together that still work their magic today. Inspired by an antique book of Victorian lullabies, and filled with glorious paintings, antique illustrations, and period photographs, The Victorian Nursery Companion is a charming collection that combines long forgotten children's poetry with affectionate glimpses into the tradition, ritual, and lore of life for baby in Victorian times. Here is a unique and original anthology that will tug at the heart of everyone who has ever known or loved a baby. As sentimental as new parents and grandparents, as adorable as infants, as endearing as toddlers and brimming over with old-fashioned images of beautiful children and happy families, it will produce a smile on the faces of anyone turning the pages.